You are currently browsing the archives for the Simple Solutions category. Global health improvement: three powerful words that embody EWB USA’s main goal and our focus, as EWB’s BU student Chapter, while we work towards improving health standards in Zambia. Often, these goals become a guideline of our responsibilities as BU engineers as we attempt to better the lives of those in our partner community by developing and implementing sustainable engineering designs. One of our main initiatives within the field of global health is a project aimed at increasing the quality of cell signal in Naluja, Zambia. Our Yagi Antenna, in partnership with CGHD’s Project Mwana, serves to expedite the delivery of newborn HIV test results through SMS text messages to the new mothers of the community. By hastening this process, more mothers will be able to take the measures necessary to ensure the health of their children during the critical stages of infancy. These efforts are meant to help the locals of Naluja and to serve as an example for other communities as they also try to combat the prevalence of HIV using m-Health initiatives. Much of the health concern in Zambia revolves around the passing of HIV from mother to infant, which accounts for 21% of HIV contraction in Zambia overall (Steidenberg). Giving an expectant mother anti-viral medication can help prevent them from transferring the disease to their children, but if the infant does contract the disease, we hope that our antenna will ensure the infant starts receiving treatment as soon as possible. Early detection decreases the rate of mortality later in life, thereby increasing the standard of living for people with HIV/AIDS. It is a great way to positively impact lives in Zambia, as much of Africa is attempting similar programs to help lessen the impact of HIV. That is why we, within our EWB-BU chapter, are so excited for the progression of the Yagi Antenna project and are looking forward to bettering our current model during our upcoming Summer 2014 trip to Naluja! A promising study conducted by the United Nations in multiple African countries shows a huge decrease in infant contraction of HIV/AIDS in recent years. Among others, Zambia “reported reductions of at least fifty percent” since 2009 (Stuart). This is an amazing feat for these countries whose main health concern has been HIV/AIDS for many years because of the inability to completely treat an infected person. Even more surprisingly, Ghana reported a 76% reduction of HIV in infants. These are breakthrough statistics for countries in Africa, as they set a great example for other developing regions struggling to prevent the spread of infectious diseases. Even more encouraging is the use of a similar text message program by the World Health Organization, which has been implemented in other countries and regions of Zambia (Thea). The WHO’s use of text message transmission reassures our organization that the work we do does have an impact on our partner community and has the potential to change statistics. We hope our progress with the antenna in Zambia will help improve the chances of even more children surviving HIV and further reduce the amount contracting the disease in the first place. Global health improvement is at the core of our organization and is an integral part of increasing the standard of living for the people in Naluja. Steidenberg, Phil, Donald Thea, Stephen Nicholson, Merrick Schaefer, Katherine Semrau, Maximillian Bweupe, Noel Masese, Rachael Bonawitz, Lastone Chitembo, and Caitlin Goggin. (n.d.): n. pag. World Heath Organization. WHO, 15 Mar. 2012. Web. 13 Mar. 2014. Stuart, Elizabeth. “How to Achieve an AIDS Free Generation? Ghana Has a Few Ideas.” Global Post. Global Post-International News, 6 Dec. 2013. Web. 13 Mar. 2014. Entering the new year of 2014 has given us a chance to re-evaluate the progress of our student chapter and development of our program in Naluja, Zambia. Recounting the successes of 2013, we were fortunate to send a travel team to Zambia during the month of August in order to implement the Cell Phone Signal Amplification project. During that trip, we were also able to complete an assessment for the water filtration system we are working on, as well as strengthen the bond with our many friends in Naluja, Zambia. We have made great strides in project development and growing our student chapter at Boston University. It has been a time of more learning, planning, and building as we look forward to another potential trip during the summer of this year. The preparation necessary for another trip involves more thorough project prototyping, development of education manuals for local villagers, correspondence with our NGO partners on the grounds (ZCHARD), day-to-day itinerary, equipment management, lodging, and much more. All these steps are necessary for a smooth and successfully trip. However, the two most important that come to mind are project development at BU and raising funds for sending students and mentors to Zambia. The first is essential for effectively installing the most sustainable and cost-efficient design for any particular project we are working on. Our goals for this next trip are to implement the water filtration system, monitor and improve the Yagi Antenna that was implemented last year, and continue to collaborate with our partners on any additional projects such as undergoing a more thorough health assessment. The fundraising aspect of our organization is the second pillar that enables us to fulfill our goals and help bring development to the Naluja catchment in Zambia. With the ever-growing prices of airfare, gas, lodging, and project equipment it is always a struggle to raise the necessary funds for our trips. Therefore, we make it a priority to have fundraising events, such as Project Mailbox and our annual Silent Auction, to help with the allocation of funds for our projects and trip. Indeed, without the support from our large EWB family, comprised of several departments at BU, ZCHARD, partners, and members and their families – we would not be able to achieve all that we have done so far. Currently, we are in the midst of our Year-End Campaign – a season long effort to help our student chapter acquire the necessary funds to make this year’s trip possible and goals met. We are excited to embark on another journey of development and relations with our partners in Zambia, as we are sure that this year will also bring successes. Finishing the holiday season, we ask you to contribute to our campaign and joins us as we GEAR UP to finalize projects and plan a summer trip. Any small donation, letter of support, or technical advice has a significant impact, so we are more than happy for you to join our cause to help bring global health to some remote areas of Zambia! Please feel free to read more on this campaign on our EWB-USA page and contact us with any questions! With the onset of greater global communication and ease of transportation around the world, the number of humanitarian efforts has grown exponentially in the past few decades. Engineering, healthcare, and science fields have especially been driving contenders in a common goal for global development around the world. The breadth and speed of such international aid has been made a priority by both major government and NGO institutions. For example, the United Nations Development Program, established in 1965 by UN’s General Assembly, is an effort to take a stand on global improvement for all who need it. With affiliations in over 150 countries, they have formed a network of programs to improve people’s quality of life in underdeveloped countries and have established “Millennium Development Goals” in order to track progress. Indeed, there have been a plethora of organizations established to provide humanitarian needs in an effort to improve people’s quotidian lifestyle – i.e: Engineering Without Borders, established in the United States in 2001. Global development efforts can be approached in a multitude of ways, as they impact every aspect of a community’s social life. It may come in the form of education, foreign monetary aid, poverty reduction efforts, implementation of projects, infrastructure, or ensuring human equality. Currently, the efforts for global change and improvement have had an astounding impact in bringing help to millions of people in impoverished communities. Spearheaded by the UN’s eight Millennium announcement, announced in 2000, are goals that researchers and other humanitarian workers will strive to achieve by 2020. These marked one of the first comprehensive and holistic programs for becoming aware and acting upon the issues around the world. The Boston University EWB chapter has assisted in spreading awareness for global change by contributing to the effort for improving communities in developing countries. Our Yagi Cell Signal Amplification project, aimed at expediting the retrieval of blood test results to mothers, and water sanitation project are both part of UN’s eight Millennium goals, as we are working towards making a direct impact within our partner community of Naluja, Zambia. When in great numbers, this local approach to global development can have a significant influence on a region. The spread of knowledge can make communities self-dependent and educated enough to implement sustainable projects in surrounding areas. Also, the personal contact that comes with a local partnership enables close progress of development and confidence that improvements are being made through monitoring efforts. The culmination of many developmental efforts within a country has the potential to have an even more significant impact on social change. Efforts for global aid, such as infrastructure and implementation of necessary solutions for improved health, form a stage for further progress in the country’s other sectors. In a more holistic view of global development, domestic progress can enable economic security and political stability to take form. These are essential attributes for maintaining a resourceful public sector, while enabling the growth of private business for diversification of the economy and a growing workforce. Furthermore, once infrastructural development has been achieved, the issue of human rights and equality can become a central focus in order to ensure flourishing relations among people. Ideally, with such development, a country will be able to join the globalization of the past few decades in order to contribute and benefit from a more unified and collaborative global effort. Assessing contributions that have already been made to the common goal for global change makes us realize the incessant need for more change and ethical issue of humanitarian goodness through collaboration. The waves of financial crisis coupled with major natural disasters have had an impact on the rate of development. However, the growing innovations in technology and healthcare have led to the development of simple, sophisticated, and sustainable solutions that can have a significant impact on future development. As stated by One World One People, an initiative to unite efforts for global change, “when humanitarian Individuals, Groups and Organizations link-up and combine their numbers and strengths – they will all succeed!” This embodies the social responsibility each of us must take upon ourselves in order to evolve humanity as a whole and ensure further exponential growth in the developing world. 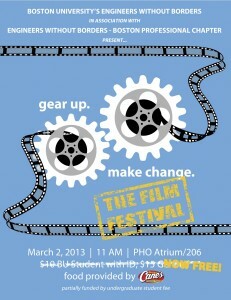 The EWB-BU organization is ready and excited to present the first ever Film Festival! We have compiled a series of short films and feature length movies that will discuss both global development and the humanitarian work we do. As we continue our partnership with the community in Naluja, Zambia this film festival is intended to reach out to more people in order to raise awareness for global health and community development. When? March 2, 2013, starting at 11 a.m.
Why? There will be food from Cane’s, great movies to watch, exciting things to learn, and many people to meet! The film festival will be a fun experience that will give you the opportunity to meet other students that are compassionate for helping communities that lack essential resources. We hope to unite all the organizations that are involved in global work and community-oriented efforts. This will establish a common ground platform for making connections, spreading awareness, gaining contacts from professional groups, and meeting motivated students through an entertaining and unique setting. Guaranteed a great experience and meeting interesting people! The world needs a paradigm shift in how things are made and how frequently things are consumed. In a consumerist society like ours and many more in the western world we must step up for ourselves and spread this message. Cynicism can only delay the time it takes one to realize the problem and will lengthen one’s exposure to harmful, avoidable, yet ignored discharge created by the same products one buys. Do you know where to dispose of frying cooking oil after making a delicious omelette? Well, although not many people fry in their house anymore, whenever we do we throw the burnt oil down the sink drain or the toilet in some cases. This is one of the worst mistakes that we can prevent. Why do we do it? Simply because no one out there has ever told us how to do it adequately. So here’s a simple solution: one should wait for the cooking oil to cool down and dispose of it in plastic or glass bottles and place them in garbage cans. A liter of oil, aka 34 fluid ounces, is enough to cause about one million liters of water (26,000 gallons) to become non-potable (unsafe for drinking), which is a sufficient amount for a person to use over a 14-year period. If you can dispose of your oil at a recycling center, even better! It could be turned into bio-diesel or fuel. Care for the environment if you want it to care for you.